As has been stated previously on this blog, Boyle Heights was developed in the 1870s and afterward with an eye to attracting well-to-do residents of Los Angeles. Boyle Avenue, in particular, had a number of large, well-appointed "Victorian" houses built among it, many of which survive. In some cases, some of the early houses became part of institutions, such as the senior homes for Jewish and Japanese Angelenos, and the older structures once on the properties were razed. This was the case with the Joseph M. Workman House, which once stood at 451 (originally 235) South Boyle. Joseph Workman was a first cousin of Boyle Heights founder William H. Workman. He was born José Manuel Workman in Taos, New Mexico, about 1832 to British native William Workman and Taos-born Nicolasa Urioste. When Joseph was nine years old, his family hastily left New Mexico for Los Angeles because his father was accused of being in complicity with the Republic of Texas and its aims to annex, by force, significant portions of New Mexico. Using the Old Spanish (which was neither) Trail, the family arrived in Los Angeles at the end of 1841. The following year, the Workmans settled on the Rancho La Puente, in the eastern San Gabriel Valley twenty miles from Los Angeles. Joseph, however, was sent back to the eastern United States to go to school and, by 1847, resided in Baltimore with his father's sister. A few years later, he was in Boonville, Missouri, staying with his father's brother, David Workman, and his cousins, including William H. When the David Workman family migrated by wagon to California in 1854 to live with William Workman, Joseph traveled with them and was reunited with his family for the first time in well over a decade. Then in his early twenties, Joseph was sent to the southern San Joaquin Valley to help manage a ranch used by his father and brother-in-law, F. P. F. Temple, when cattle were sent to the gold fields from Los Angeles County. He remained there for some fifteen years and married Josephine M. Belt, a Stockton native. In 1870, he returned to Rancho La Puente and was given 800 acres by his father, on which Joseph raised sheep and farmed. According to an 1889 biographical sketch, "in 1881, desiring better advantages than the country offered for educating their children, Mr. and Mrs. Workman decided to lease their ranch and remove to the city. 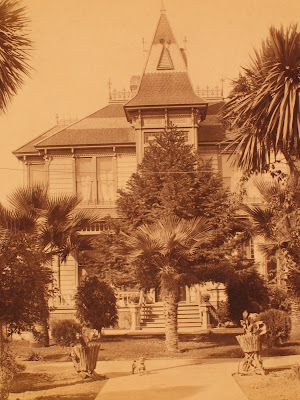 Buying a large lot, 162 x 300 feet, on Boyle avenue (Boyle Heights), they erected their present fine residence." The lot was purchased from Joseph's cousin, William H. Workman and his wife Maria Boyle, for $800 and, by January 1882, Joseph hired the architectural firm of Kysor and Morgan to build "a neat two-story residence." Ezra Kysor, the first trained architect to practice in Los Angeles, was well-known for his designs of the Pico House hotel, St. Vibiana's Cathedral, and the Boyle Heights home of William H. Perry, now at the Heritage Square Museum complex in Highland Park. Kysor also designed a remodel of the home of Joseph's father, now at the Homestead Museum in City of Industry. By fall 1882, contractors McAulay and Chisholm were building the home, the external dimensions of which were 36x32, meaning the home was somewhere in the 2,200 square feet range. The cost of the house was $4,000, a considerable sum for the time. The 1889 Illustrated History of Los Angeles County referred to the home as "one of the most picturesque and beautiful homes in this part of the State." Joseph and his family lived in the structure for about a decade or so. There was a significant real estate boom in the late 1880s, followed by a bust. The national economy went into depression after 1893. Meanwhile, Joseph took out loans with a Los Angeles bank and was unable to repay them. In 1895, foreclosure proceedings were initiated and that year the family left the Boyle Heights house. Joseph lived in several locations in the city before passing away in March 1901 at the home of a daughter in south Los Angeles. He did, however, return to Boyle Heights in that he was interred at Evergreen Cemetery. Concerning the house, it is not known when it was torn down. The property is now the International Institute of Los Angeles, which was founded by the YWCA and which has been on the site since the 1920s. 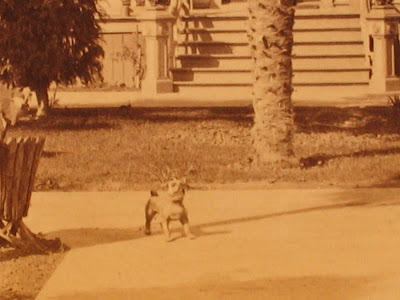 Now, if we can only figure out whether that dog on the sidewalk in front of the house actually stayed still for the photograph because it was alive or stuffed! These photos are great! Thanks for the info on Boyle Heights. I'm looking for someone to speak at a post show event on April 24 at Shakespeare Center of Los Angeles. Current production of Romeo and Juliet is set in 1930's Boyle Heights! Can you recommend a speaker? Come see the show April 5-24. www.shakespearecenter.org for tickets and info. This is wonderful! I been wondering if something like this existed for the Boyle Height community. I really appreciate this and I am sure many others will!